Making streets safer for people, means making streets walkable, accessible and inclusive of everyone, especially the most vulnerable ones such as children, the elderly and people with disabilities. As part of the Bloomberg Philanthropies Initiative for Global Road Safety, NACTO-GDCI is providing technical assistance to the municipality of Bogotá to make the streets of the Colombian city safer for all. Colombia’s capital is one of the densest cities on the planet. Like many large cities, it deals with a lack of public spaces and fights to make streets safer for everyone. 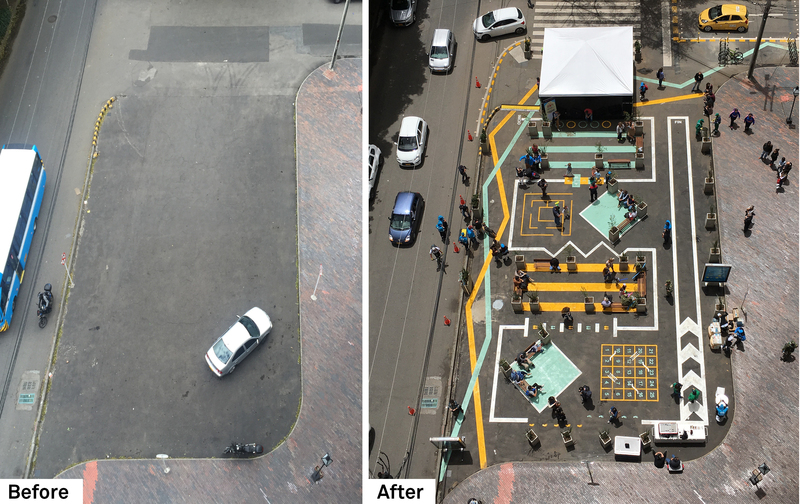 This year, the city of Bogotá undertook a project to reclaim underutilized areas of the city and convert them into spaces for people. The first space to be converted was a surface parking lot located in the neighborhood of Chapinero at the intersection between Calle 80 and Carrera 9. The secretariats of mobility and city planning, NACTO – GDCI and Bloomberg Associates, worked with several city agencies to organize a pop-up event on September 18th in which the entire community was invited to join. The event, complemented with music, performances, and activities for children, was the occasion for everyone to express their opinions about the possibility of a new public space at that location as well as safety improvements for pedestrians. At the end of the event, almost 300 surveys were collected and an overwhelming majority (94%) of the people who participated in the survey reacted positively, expressing interest in having more places to seat, trees and plants and open-air events in the space. The great response from the community encouraged the city to transform the space into an interim plaza and to adopt the project as the first step toward a formal citywide plaza program. 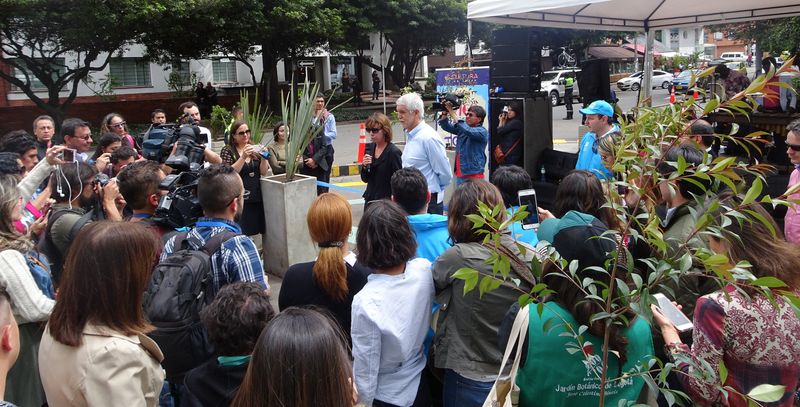 On October 15th, at the ribbon cutting of the new “plaza calle 80”, the mayor of Bogota, Enrique Peñalosa, announced the beginning of the plaza program aiming to reclaim more and more public spaces in the city to provide safe streets for pedestrians. The interim plaza, included pedestrian improvements, such as a safe crossing and traffic calming measures (speed humps, lane narrowing and a curb extension) on calle 80. In the next phase of the project, other road safety improvements are planned, in particular on the high traffic arterial road adjacent to the plaza, Avenida Carrera 9. The interim intervention was made possible thanks to fund provided by Vital Strategies, one of the partners of the Bloomberg Philanthropies Initiative for Global Road Safety. Following the inauguration of plaza 80, a new pop-up plaza event took place in the neighborhood of Alquería in the southern part of the city and another one is in the pipelines for mid-December. Feedback will continue to be collected to look at the opportunities to make these public spaces more permanent, while additional sites for plazas throughout the city are analyzed. During the months of July and September, two community workshops were held in the neighborhood of Alquería—as well as in a second neighborhood in the North part of the city, Usaquén—in which the participants were invited to reenvision their neighborhood. The participants were invited to help redesign their street based on the principles of the Global Street Design Guide and to prioritize the areas of intervention. The event in Alquería has been the occasion to test a few of these ideas: not only by temporarily converting a parking into a plaza where people could play, relax and share their opinions, but also by testing safe pedestrian crossing to access the new extended public spaces and by temporarily redesign of a conflictual intersection which the community had prioritized during the workshops. The next immediate step is to now repeat the Alquería experience in the neighborhood of Usaquén in the month of December which will be followed in the first months of 2017 by interim implementations using cost-effective materials to make the streets of Alquería and Usaquén, and ultimately of the entire city of Bogotá safer and inviting for everyone.